Esmerelda Strange :: One Woman Band!
" 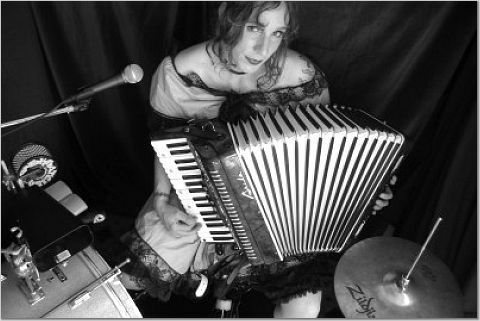 It's like watching a punk rock polka goddess making good on a bet with some ranchero band after a tequila binge in Tiajuana"
"...eerie and evocative aggressive accordion based funk folk"
Esmerelda Strange is a singer/songwriter/multi-instrumentalist based out of San Francisco, CA. 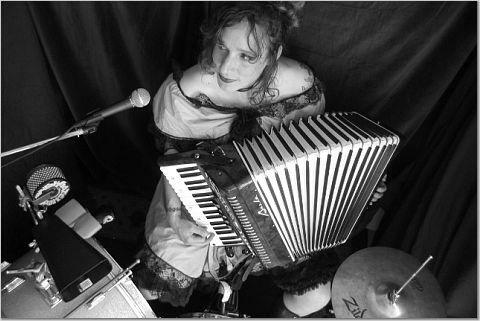 Drawing on the vaudevillian tradition of the one man band; she plays the accordion, drums and sings all at the same time. Ms. Strange would describe herself as a punk rock band, but her musical influences and the resulting product contain elements of urban folk, cumbia, circus music, Norteno/ranchero, and an Eastern European gypsy sound. She sings both in English and Spanish. She is known for her saucy sense of humor and salty lyrics. Her music has been described as "acoustic electro-clash goes to the punk rock circus in Mexico." Esmerelda Strange is a totally unique artist. Her shows and the projects she performs with reflect her taste for the original, the theatrical and the bizarre. When she is not touring with Heavy Pedal Cyclecide Bike Rodeo..with the worlds first pedal powered midway, she is the band for the burlesque spectacle that accompanies The Lifesize Game of Mousetrap, a giant kinetic sculpture based on the popular childrens board game. Frequently in her solo shows sideshow artists will make guest appearances, and she's got a few tricks up her own sleeve as well. She'll be coming to a town near you......Someday.